Get ready for this Monday’s show by recreating the looks from last year! It’s the most wonderful time of the year! No, not Christmas. Well, that too. But, this weekend marks this years annual Victoria’s Secret Fashion Show! Sadly, no matter how pretty this year’s looks are, I’m afraid in the real world you’ll still have to wear clothes over them. So, let’s take some inspiration from last year’s show and find some outfits worth wearing in real life. Last year was the first time Kendall Jenner walked the VSFS runway, and she’s returning again this year. Her look in the 2015 show seriously reminded me of this music video from my childhood, so I went with a wintery/ice feeling to recreate it. 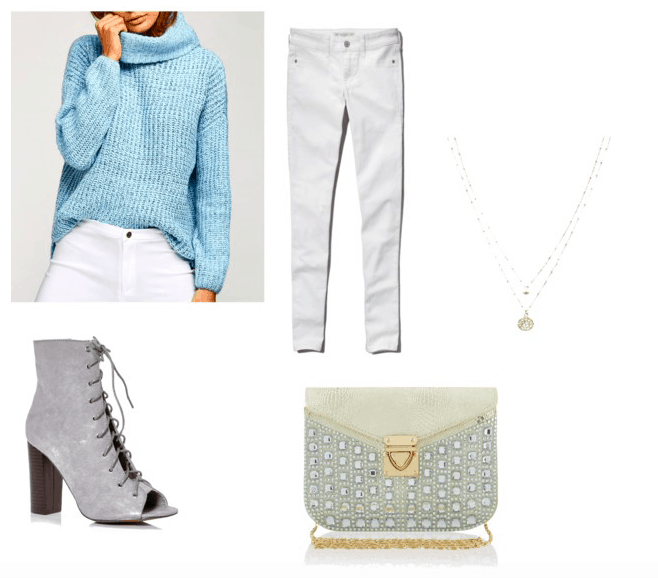 White jeans, a cozy sweater, and lots of ice (meaning jewels… I’m sorry, not my best joke). This is Jasmine’s 5th year at the VSFS, and she’ll also be wearing the coveted fantasy bra at this year’s show. Last year, her ensemble was all warm colors, floaty fabric and tassels, making it a perfect spring break look! At only 20 years old, Taylor Hill is one of the youngest Victoria’s Secret models. She’s also the same age as me, which scares me a little. She’s also returning for this year’s show, and her look at last year’s was quite something. As lace-up black leather pants might be a bit much for campus, try a pair of trendy lace-up jeans instead. Get the same vibe with a leather jacket, plenty of jewelry, and a fringed clutch. Did you watch last year’s show? Do you like these looks? Which is your favorite? Let me know in the comments!